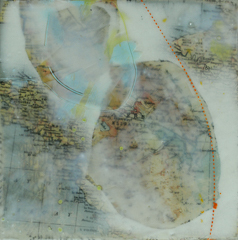 In this mixed media painting class, students will experiment with new possibilities for artistic expression by considering some unconventional materials and techniques. Along with collage and paint, we will investigate use of tar, wax, and sheetrock mud to enhance artistic expression. We will be working with some soft grounds, allowing for use of mark making tools found in your kitchen, local antique store, or hardware store. We will consider use of stains and pigments such as dry natural pigments and oil pigment sticks to enhance your designs. Students will leave this workshop with more ‘tools’ in their art supply box! This class is suitable for all levels. Jane Wells Harrison received a Master of Fine Arts in Painting and Drawing from East Carolina University, and was especially influenced by Paul Hartley and Robert Ebendorf. Jane is the former director of the Visual Arts program at Caldwell Community College and has also taught at Pocosin Arts, Penland School of Crafts, and East Carolina University. She maintains her studio practice in Happy Valley, near Lenoir, North Carolina. 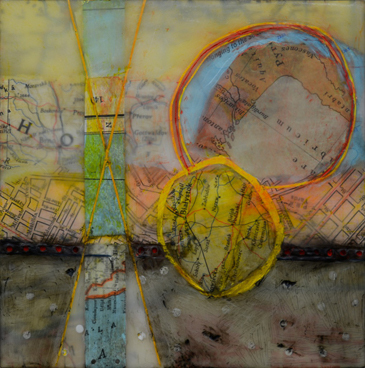 Jane Wells Harrison is an artist working primarily with paint media, often encaustic. 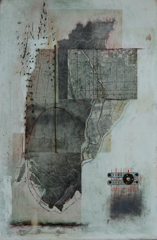 Collage is usually an element of her work; therefore her paintings can be characterized as shape and color abstractions. Her artwork serves as an interface between her life and the socio-political environment, and so any underlying content is frequently prompted by current events, both personal and global. Brushes – a variety of natural bristle brushes for use in wax. Pigments of your choice. If you plan to use oil paint include an odorless solvent on your list. Powdered pigments such as graphite, charcoal, pan pastels. Please do not bring toxic powdered pigments such as cadmiums or cobalts.